“Why are all the hotels in Naha fully-booked?” Nori asked, scowling at the search results on Agoda. “I don’t know. What dates are we going to be there again?” I replied. 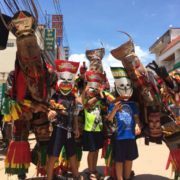 Since we first moved to Thailand 3 years earlier we had wanted to attended the Phi Ta Khon Festival otherwise known as the Ghost Mask Festival. Scott had seen pictures in a Thai magazine when we first arrived and said this is must. 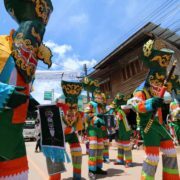 The annual festival is held in late June/early July and part of a larger 3-day festival called Bun Luang that has been celebrated for over 400 years. 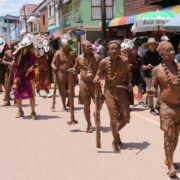 We had a difficult time attending in previous years as the dates are chosen from the agricultural calendar so the festival dates are only announced 3-6 weeks prior by the village elders. With 4 young kids, I’m a planner and rarely schedule trips last minute so this year I cleared our calendars for June and July to guarantee that we could make it. The hardest part about attending the festival is knowing when it’s held. Since it’s announced about 2 months before, it makes planning a trip for most people quite difficult. 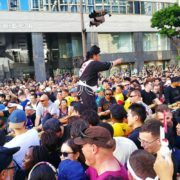 It is usually held around the end of June/early July. The best place to find out is to follow Richard Barrow who announced it on the same day the local tourism board announced it https://twitter.com/RichardBarrow. Otherwise you can contact either the local tourism board directly or one of the hotels listed below. If hundreds of people wearing lurid, ghoulish masks with schlongish noses and shaking giant wooden penises doesn’t sound like a family-friendly event to you, then you’re clearly not from my family AND you’re not getting an invite to my next party. 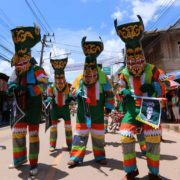 I’d been desperate to see the Phi Tha Kon (ผีตาโขน) “Ghost Mask” festival in the northern province of Loei since I arrived in Thailand. 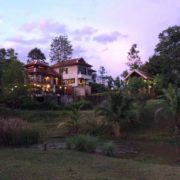 It’s not that difficult to get to: a 1-hr flight to Loei followed by 1.5-hr drive to Dan Sai Village. But work kept getting in the way of my vacation (something I plan to address). And it doesn’t help that the date for the festival is divined each year (sometime between March and July) by local mystics. This year, however, the penises were aligned and the festival weekend was wedged between business trips to England and Singapore.